"I can’t predict whether we will reach an agreement," Brian Hook said. U.S. and European partners have held "constructive talks" toward a side agreement to address what the Trump administration sees as the flaws in the Iran nuclear deal, according to the top U.S. negotiator. 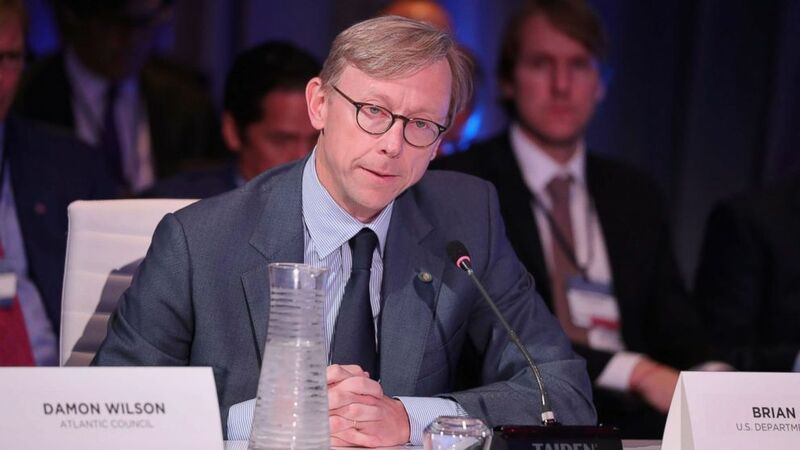 "We have had constructive talks with the Europeans toward a supplemental agreement but I can’t predict whether we will reach an agreement with them or not," said Brian Hook, the State Department's policy planning director who led the U.S. delegation to Europe last week. "We have a goal in mind, and we either will reach agreement or we won’t." But even if they reach a deal, it may not satisfy President Donald Trump, who has threatened to snap sanctions back into place by May 12 if there is no side agreement, effectively destroying the deal. "If we can reach an agreement, then that will be presented to the president by the secretary of state and the national security adviser, and then he will make a decision on whether he wants to remain in the deal or stop waiving sanctions," Hook said. 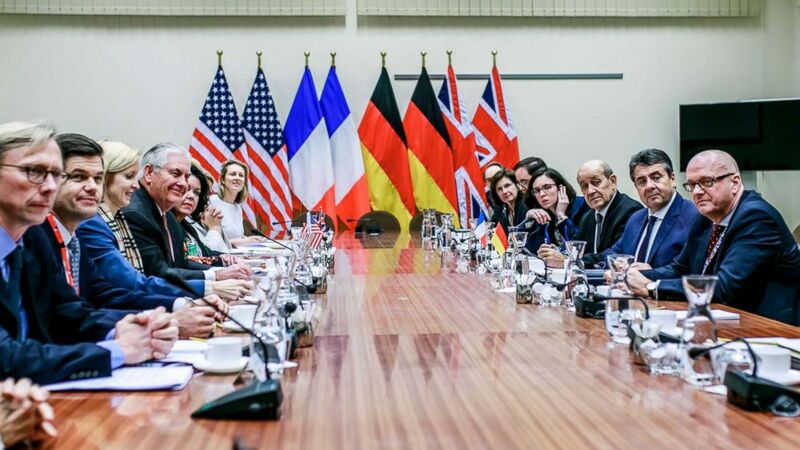 Hook and his team met with their German, French and British counterparts Thursday in Berlin, and with all parties to the Joint Comprehensive Plan of Action, or JCPOA, Friday in Vienna. He wouldn't say whether the talks have yielded substantive progress beyond being "constructive." (Paul Morigi/Getty Images for Concordia Summit) Brian Hook, Director of Policy Planning, U.S. Department of State, speaks at The 2017 Concordia Annual Summit at Grand Hyatt New York, Sept. 19, 2017, in New York City. "Where we have agreement, we are capturing the agreement, and where we have differences, we are working to narrow them to see if we can reach an agreement." Trump said in January that he will no longer waive U.S. sanctions on Iran – a U.S. commitment under the deal -- unless Europe worked with the United States to address three issues: curbing Iran's ballistic missile program, strengthening inspections under the agreement and dealing with the so-called sunset clauses, where limits on Iran's enrichment levels are lifted after certain periods of time. Last Thursday's meeting in Berlin was the third of its kind, after similar meetings in London and Paris in January and February. Even if there is an agreement and Trump approves it and stays in the deal, there's no plan for what would come after that, with Hook saying the only guidance the president gave his team was to reach this deal. "I won't speculate beyond May 12 because that's as much as our negotiating instructions allow," he told reporters Wednesday. There are four other parties to the deal -- the European Union, Russia, China and Iran -- and they have made clear that the United States can't change the terms of the agreement on its own. It's unclear how the United States and the Europeans could have a side agreement that potentially fixes the deal's flaws without working with the rest of the E.U., the Russians, Chinese or Iranians. But the hope is that the United States and Europeans can use their economic strength to pressure the others into agreement. "The U.S. and E.U. have the majority of the economic cards. Therefore, they have the most leverage to push for any changes to the deal," said Behnam Ben Taleblu, the senior Iran analyst at the Foundation for Defense of Democracies, a right-leaning think-tank. (Michael Gottschalk/Photothek via Getty Images) German Foreign Minister and Vice Chancellor Sigmar Gabriel, French foreign Minister Jean-Yves Le Drian and Rex Tillerson, foreign minister of the United States, attend attend E3-foreign ministers meeting, Dec. 5, 2017, in Brussels. As the Trump administration has in the past, the State Department’s Hook also conceded that Iran remains in "technical compliance" with the deal. But given that Trump doesn't think the deal is adequate, it's clear technical compliance is too little for his administration. As ABC reported last week, it was at that Friday meeting in Vienna where Hook also met one on one with Iranian officials to demand the release of the four U.S. citizens detained and one missing in Iran. He would not provide any other details, citing the sensitivity of the subject. Short of a side deal, the United States will withdraw from the agreement, which he blasted for its "many deficiencies" that are a threat to U.S. national security. "We can't allow the deal to remain in place without the supplemental agreement to address its deficiencies," he said, adding later that the administration is making contingency plans for withdrawal, as it prepares for "any eventuality." The United States and Europeans have spent half their meetings focused on negotiating this side deal and how to handle Iran's "malign" activity, according to Hook, including the Iranian Revolutionary Guard Corps and its funding, cyberactivity, maritime aggression and human rights abuses. Hook dismissed the effect of the United States’ withdrawing from the Iran deal on talks with North Korea, saying North Korea has a history of noncompliance and negotiating in bad faith.